Another long run down, only 1 more to go before Marathon Weekend! In January, the marathon measured about 26.85 miles for me. This weekend, I ran 27 miles--the most I've run in a 48 time period! Tuesday--ran 8.56 miles in 1:29:23. Mile 1: 10:06, Mile 2: 9:32, Mile 3: 9:13, Mile 4: 10:23, Mile 5: 10:29, Mile 6: 11:09, Mile 7: 10:34, Mile 8: 11:43, Mile 8-8.56: 11:10, Average Pace: 10:27. Kory and I went to see Big Hero 6 and I *might* have bought the new Garmin 220 for my parents to give me for Christmas!! Wednesday--rest. 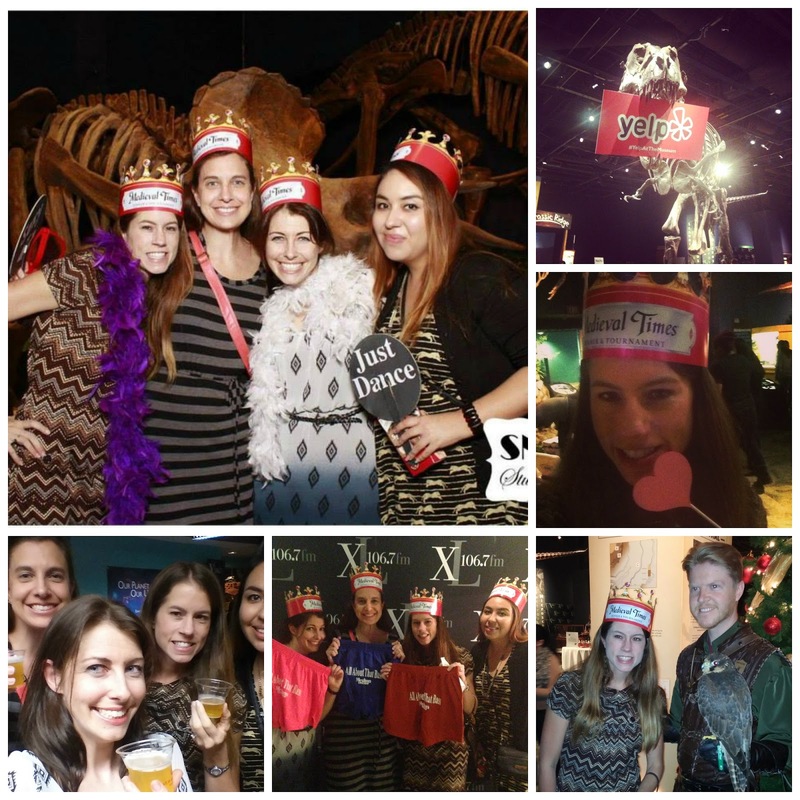 I attended the Yelp night at the Museum. So much fun! And sooo much food! Thursday-- 6 miles in 1:04:34. Mile 1: 10:52, Mile 2: 10:28, Mile 3: 10:38, Mile 4: 10:25, Mile 5: 11:46 Mile 6: 10:49, Average Pace: 10:49. Friday--rest. Kory and I went to Sweet Tomatoes for dinner so I could load up for the weekend runs! Saturday-- 9 miles in 1:40:11. Mile 1: 10:18, Mile 2: 10:12, Mile 3: 11:27, Mile 4: 10:28, Mile 5: 11:42, Mile 6: 11:10, Mile 7: 11:14, Mile 8: 11:28, Mile 9: 11:27, Average Pace: 11:06. I was running with a friend and we ran differently than I normally do. We ran 2 miles before we started our intervals (I had been doing 4 miles). Then we did 3:1s instead of 2:1s. And it felt like we were running slower but I guess the fact that we ran an extra minute each time made up for the fact. Either way, I felt really good at the end of the run and decided to try it the following day. Sunday--18 miles in 3:20:39. Mile 1: 10:30, Mile 2: 10:17, Mile 3: 11:11, Mile 4: 11:18, Mile 5: 11:18, Mile 6: 11:01, Mile 7: 11:07, Mile 8: 11:16, Mile 9: 11:42, Mile 10: 11:08, Mile 11: 10:59, Mile 12: 10:57, Mile 13: 11:02, Mile 14: 11:19, Mile 15: 11:22, Mile 16: 10:54, Mile 17: 11:35, Mile 18: 11:35, Average Pace: 11:09. So I kept the same strategy as yesterday. I only ran the first 2 miles before starting my intervals. And then I did 3:1s until mile 16 where I dropped to 2:1s. And I was soooo happy with my pace!! My 15 mile pace was 11:36 and 16 mile pace was 11:44. I noticed that when I hit my 16 mile time from 2 weeks ago, I was already at 17.1 miles today. And I beat last years 18 miler by 7 minutes!! For dinner I was craving greasy wings so off to Hooters we went! Now help is needed--blisters. I've had a blister above the outside of the ball joint on my big toe for a while now. It comes up on longer runs but usually goes away by my next run. I've tried everything socks--balega, thorlo, feetures, injinji, procompression, zenzah--body glide, kt tape, band aids. I rotate between 2 different brands of shoes and it happens in both. Last night I popped the blister I had. Well, after my run today, I had one on the bottom of pinky toe, one on the other foot in the same place that I've been having one, my normal one showed back up, and then I got a new monster of a blister UNDER that one (how can you get a blister under another blister???) But I'm in such a loss as to what to do. I'm a little sore today but the blisters are really what's killing me!! !